Question: You say that The Zohar is the system of ties between us. How are these connections expressed in The Zohar: in the shape of the letters or the meanings behind the words? Answer: You won’t find the symbols of these connections in letters or words, and not even without them. We should view The Zohar as a connecting device and nothing more. I don’t know how it works. All I know is that if my desires are correct and I am reading The Zohar with the hope that these desires will be fulfilled, it will occur. I have a certain device that I adjust and plug into electricity, but the one last drop is missing: a little bit more of my thought and desire for it to occur, for the device to start channeling electricity and begin to work. I should be anticipating it, nothing more. It is regarded as “awaiting salvation.” But we must, to the best of our ability, prepare our desires and needs so that they are fit for correction as much as possible. After all, an unripe desire doesn’t merit correction. Desire the time which has passed and a new desire needs to be used or the same desire but at a higher degree won’t merit correction either. Everything has to occur with the utmost precision, and then the Light that Reforms comes and performs our merging with the Creator. This is what our work entails. The Book of Zohar, Chapter “Mishpatim (Ordinances),” Item 343: He [King Solomon] signed his chair with a seal engraved with the holy Name, took a ring on which the holy Name was engraved, went on an ascent, riding that eagle, and went away. Question: What is this ring? This is the origin of the wedding ritual where people put rings on each other, symbolizing their bestowal to one another and their connection. 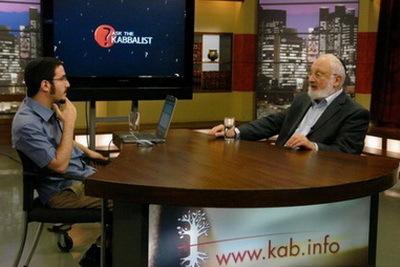 Question: Throughout all of history, Kabbalists passed the science of Kabbalah from one generation to the next. But on the other hand, they created a special concealment over this science to make sure it wouldn’t expand all over the whole world. Why? Answer: Kabbalists reveal their attainments in concealment. That’s why it is written, “When revealing one measure, conceal two.” This is talking about the revelation of the necessary desire in a person, in which he will then feel the upper world. Our nature is desire, and only if this desire is present do we perceive the world inside of it. The greater the desire, the more it perceives. All the objects in our world differ from one another only by the size of the desire. The desire of level 1 is still, level 2 – vegetative, level 3 – animate, and level 4 – human. If the desire intends to enjoy by itself, then it is in our world. If it intends to give pleasure to someone else, then it is in the upper world. It’s known that pleasure can only be felt to the extent that one has a desire for it. In other words, the Light can only be received when there is a vessel. Concealing two measures means that a Kabbalist teacher must create a concealment in a student—the desire of one measure, the need for revelation, and the concealment of one more measure so this desire for revelation would be for the sake of bestowal. In that case, the student will merit revelation inside of that corrected desire. We received this land when we came out of Babylon. Our spiritual root in relation to the material world lies only here. Baal HaSulam says that here, we have to give an example to the entire humanity of what it means to be a nation corrected in accordance with the upper force, with nature. All the nations and the entire world have to abide by this natural law in order to continue to exist. Otherwise, a mass destruction will begin. We must endeavor so that all the wars of the state of Israel were not in vain. We have to be faithful custodians of what we have obtained thanks to those who fell in wars. A succession of endless wars is not the way to advance the country. On the contrary, in honor of those who have given everything for us, we must understand how to live on, how to put an end to wars and killing. It depends on us. So, instead of talking, let’s do what we have been entrusted with. Our duty is not only to prepare for a possible war, but to advance toward a true reconciliation, to peace. Only united with each other will we pass on the peace between us to everybody else. What does “behind and before” mean? Baal HaSulam explains that “You hem me in behind and before” means that it’s both when the Creator is revealed and concealed. After all, He is the only one who rules, and everybody will attain it. And then the notion of time and the feeling of past, present, and future will disappear. If there is only one force at work, nothing changes and everything is at absolute rest. The attainment comes gradually, in correspondence with how we unify with this single force, the Creator. Besides, we don’t lose control of reality and turn into nothingness, but rather become like Him. We, together with Him, become the same exact magnificent, governing, singular force. And neither of us cancels the other: The Creator doesn’t nullify the created being, nor does the latter nullify the Creator. Moving forward and closer to Him, I don’t nullify myself. Instead, it is my ego that gets cancelled, while I rise like the Creator and come to adhesion with Him in all His perfection. Then, I discover that I have been governed by this one force all the time, but it was simply hiding from me on purpose so that I would acquire it on my own and become as autonomous and magnificent as this singular force, the Creator. As I keep building myself in equivalence to Him, the Creator appears before me as an equal, magnificent partner and thereby we merge. Every time when I gain autonomy, by transcending my ego in uniting with the group, I find the Creator within us, and thereby we unify together. The degrees of our connection, of how much tighter we bond with each other, are the spiritual ladder of rungs, the ladder of the worlds. We bond in the minimal degree, overcome the minimal thickness of our desire (Aviut Shoresh), and thereby attain the Creator only at the level of the Light of Nefesh. When we unify in a greater degree, we attain Him as the Light of Ruach, followed by the Light of Neshama, Haya, and Yechida. Thus we pass forth from the world of Assiya to the world of Yetzira, followed by the worlds of Beria, Atzilut, Adam Kadmon, and finally reach the world of Infinity where our unity has no borders and everything is linked as one whole. Until then, this unique force keeps working among us, confusing us, and nurturing us in all possible ways so that we would develop a need to unify among ourselves and merge with it. However, this force acts from “behind the scenes.” That’s how we play with children since we want them to “brainstorm” and use all their skill to do something independently. We know that only when a child exerts personal effort does he gain wisdom and understanding of life. In this, we are the same. In our spiritual work we cannot do anything ourselves because we don’t know how to identify the unified force and relate it to many situations in our life. What should we attune ourselves to? Simply saying that the Creator is everywhere doesn’t help. This is why we are given the group, and if we unite together, we discover this unified force called “there is none else besides Him” between us. The Creator deliberately split the creature He had made into a multitude of parts so that they would reassemble once more into a single thought, a single desire. Then, in this common desire, they will reveal the unified force that exists only in the connection they have formed, in unity and adhesion with them. By uniting together into one desire, we don’t attain this force outside of us, but reveal ourselves and this force together as one whole. Indeed, there is no Light without a vessel (Kli), there is no Creator without the creature. The closer we bond together, the more we reveal the Creator within our unity. In other words, our unification is the Creator. That is what it was at the start of creation, after which we dispersed and descended to this world in the form of small egoistic creatures. Therefore, by uniting together we are building the Creator. We are creating Him independently, which is why He is called the Creator (in Hebrew Bo-Reh or “come and see”). There is no other place where we can build Him, discern Him, unite and achieve adhesion with Him, but only within our unification in the group. And all of humanity will need to connect together in the same way.